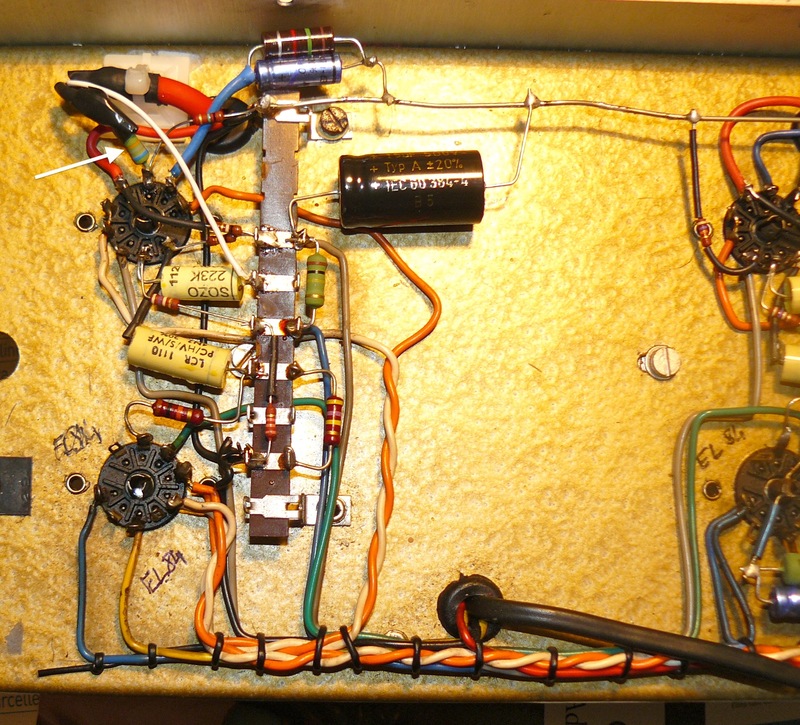 WEM “Control” ER 15 | It-11 Audio / Tonegeek"
15 Watts, 2 x 12AX7, 2 x EL84 and one EZ81 as double diode. 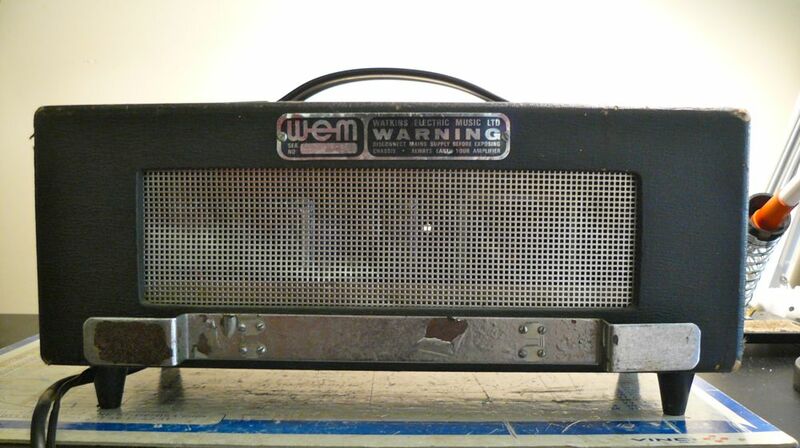 This is a mid-60′s valve amp from Watkins / WEM. 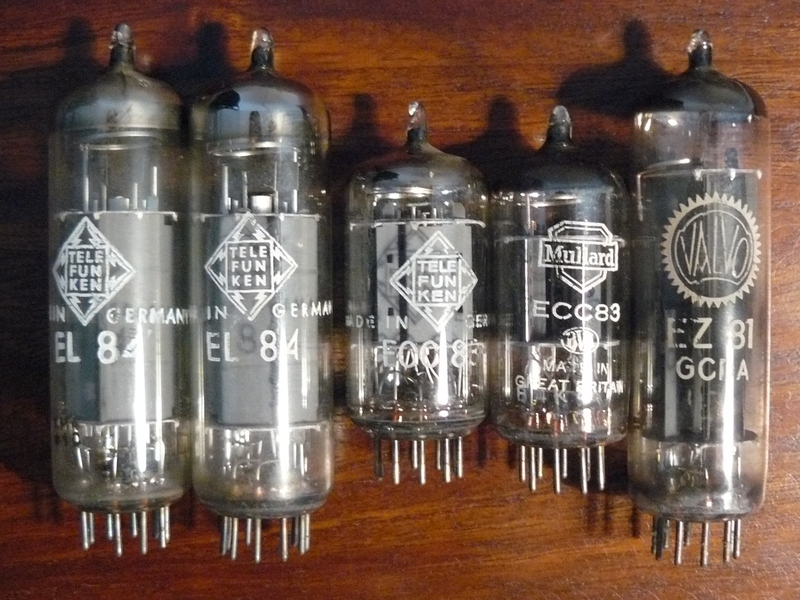 Nice tubes. Still alive ? 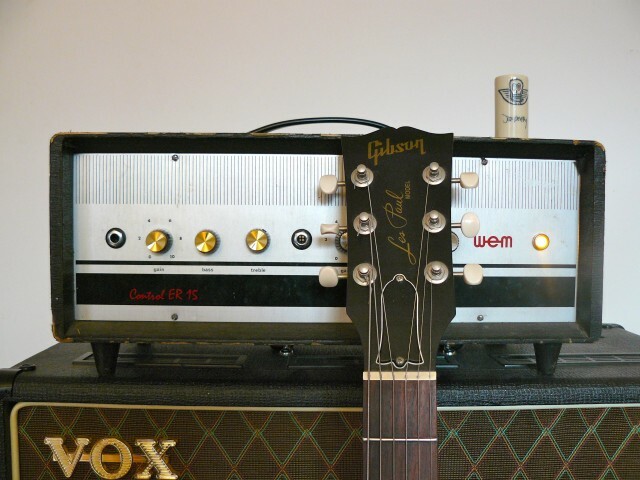 You could also see this site … vintage hofner ! OK, one fuse dead and the EZ81 died with a very cool blue flashlight after a few minutes (unfortunately for a mojo Valvo). 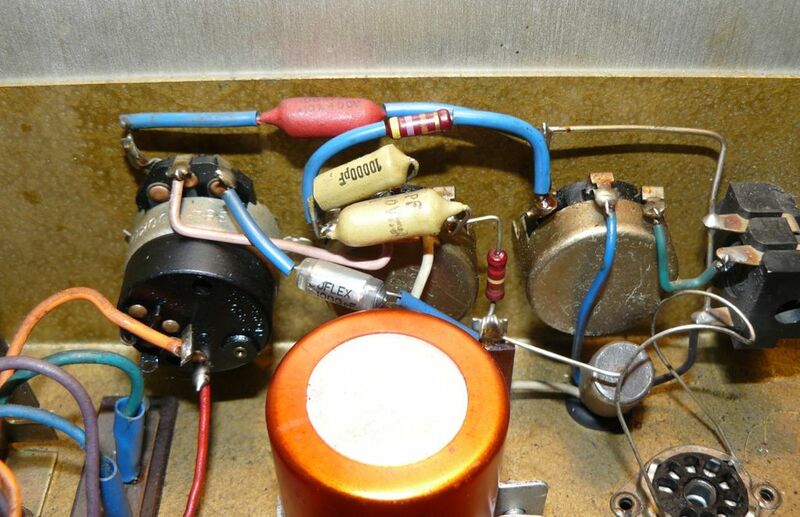 New fuses, new JJ EZ81. 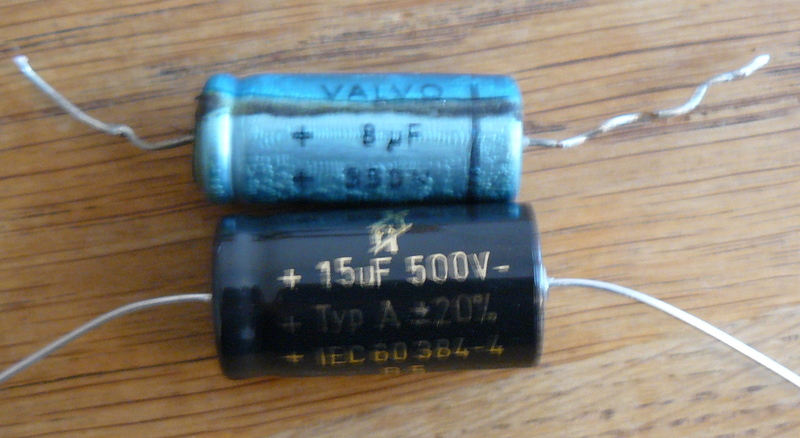 Voltage check without tubes, then with tubes. 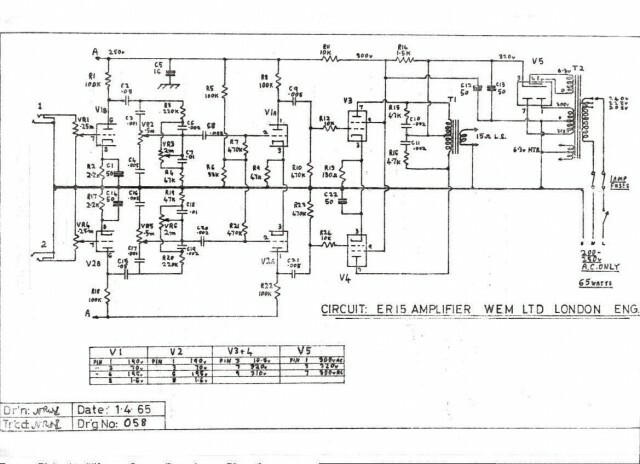 Everything seems to be OK. EL84 bias current at 46mA (cathode resistor is 130Ω on schematic, my amp has a 100Ω … quite hot). Then, I plugged a cab instead of 16Ω resistor used for testing stuff. Wow, this thing sounds !!! With a strat, very nice clean tone, and crunch at maximum volume. Pots are a little scratchy … to be fixed. 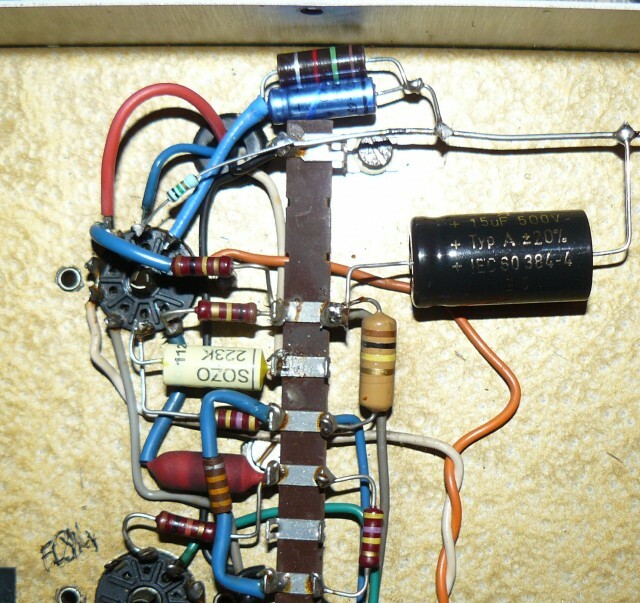 Some say that the Marshall 18W is based on this amp (in fact, I’m wrong here : Marshall 18W is based on Watkins Dominator). The WEM has two channels, why not mod one to exact spec of Marshall 18W ? Before filter capacitors change, EL84 cathode resistor was 100Ω, and Ik was 46mA. 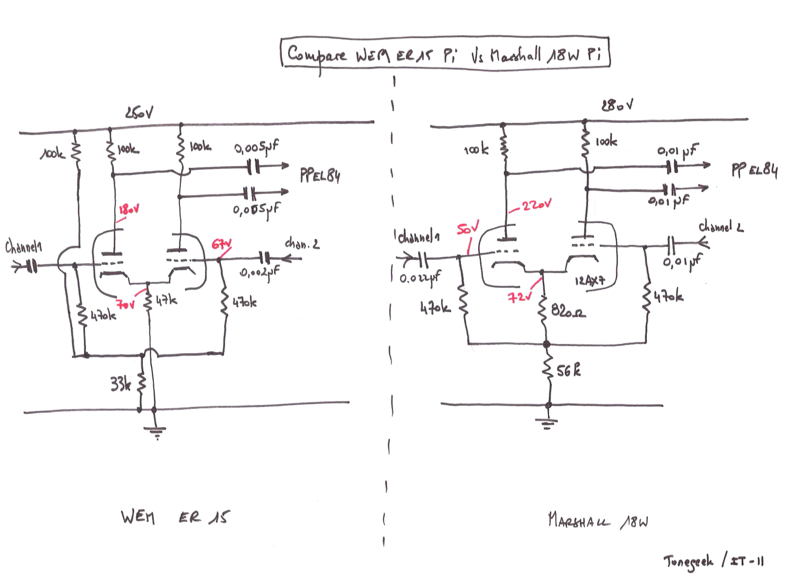 After filter capacitor change, all voltages has increased so I changed Rk to 120Ω, for a new Ik = 44mA (Va=320V)… I could try 150Ω to preserve EL84 life … one day. 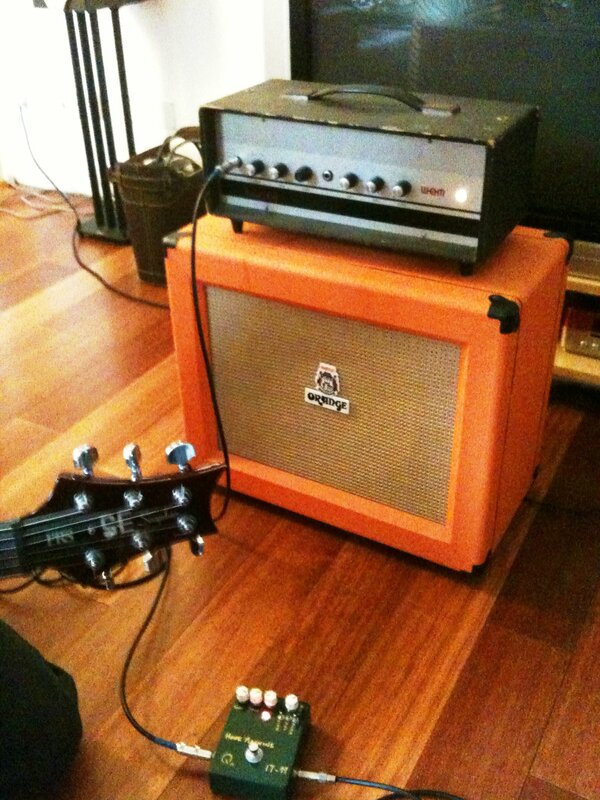 PRS, my Honk Machine, WEM ER 15, Orange : great combination ! 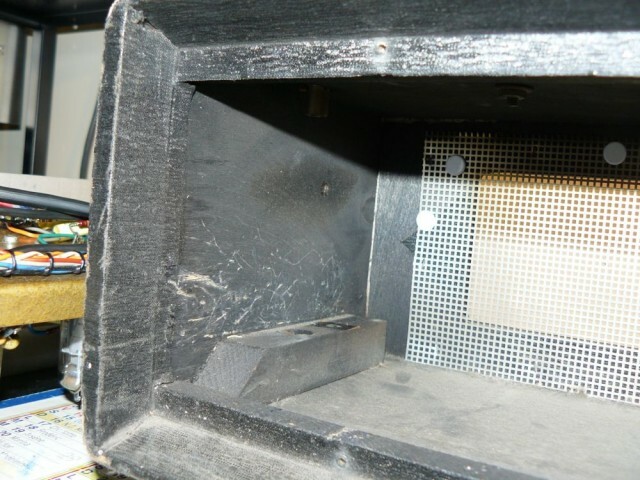 Some more pix and measurements for Jonathan. Hope this will help ! 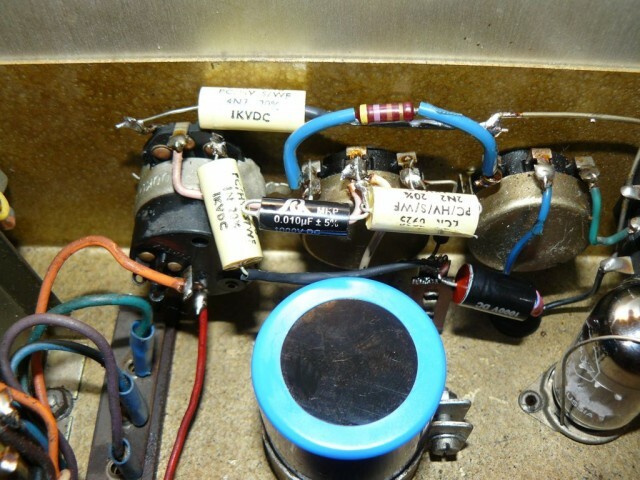 This entry was posted in Amps and tagged ER 15, ER15, tube amp, WEM. Bookmark the permalink. I bought a Control ER 15 about 13 years ago and it’s still working ok. 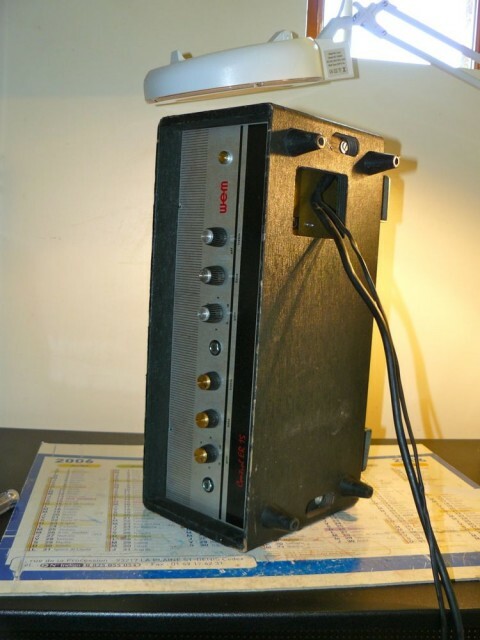 However, mine was turned into a combo amp with one speaker (12″, I think) at some point. Your project encourages me to refurbish the amp a bit and I also consider turning it into an amp head again. 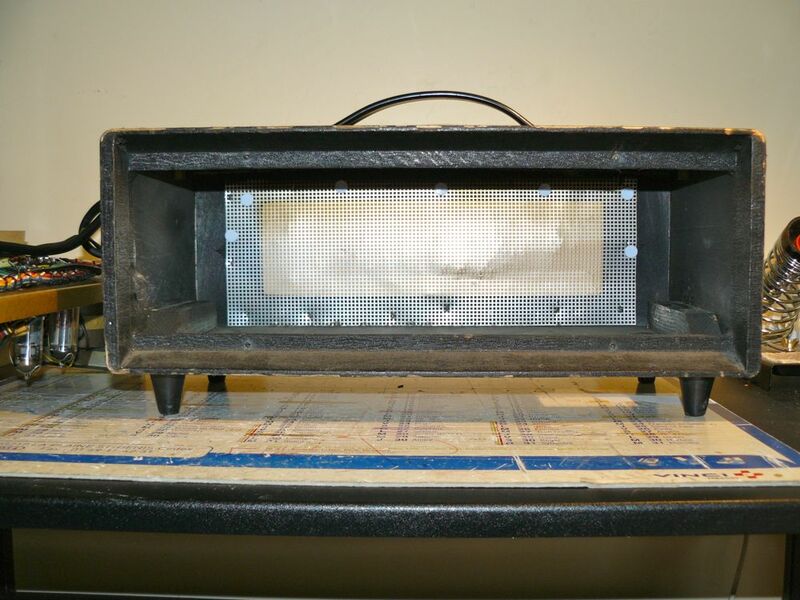 I’d be interested in the measurements of the original amp (also thickness of the material) and a photo of the back side. Are your knobs and the lamp original? Nice project you have there ! I’m on vacation right now. I will measure and post the dimensions in late August (and photo). I replaced the light bulb (easy to find). 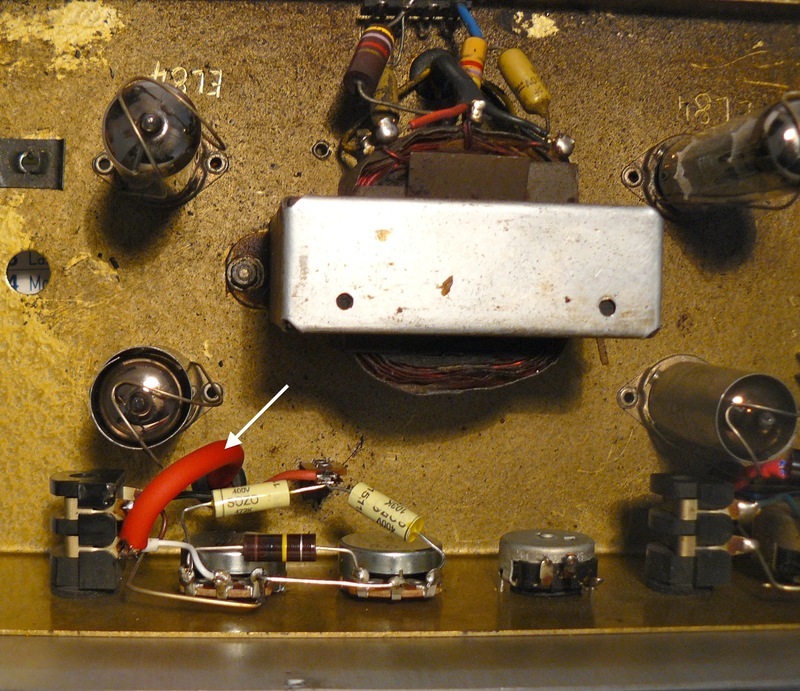 Knobs on the “Wem” channel are original, knobs on the “marshall 18W” channel are new (Marshall spare parts). The Marshall 18W channel is a quite easy mod, and it sounds amazing. b) somebody (the owner before me?) did this mod (and also replaced the rectifier tube by diode. I think b is more plausible, as there seems to be no evidence that a version like a ever existed. But I will ask in a forum (and post pictures…). I have one of these and am looking to sell. Could you tell me how much they sell for in working order. 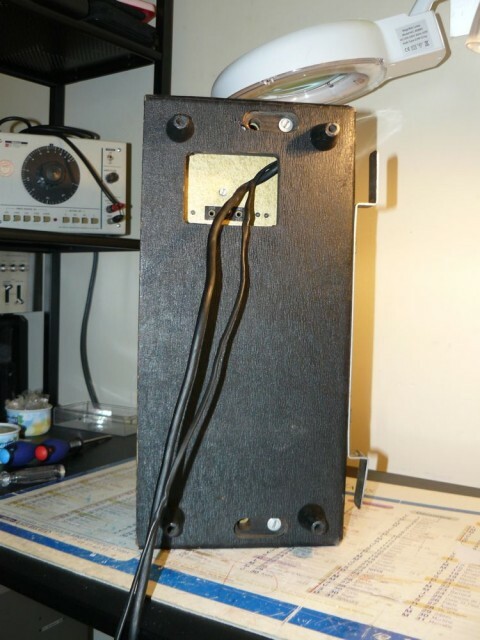 The case is in very good condition with no major damage just a couple of minor bumps and slight rusting on metal brackets. Don’t know exactly … 300USD if pristine ? Did you look eBay ? I’m looking to buy one…any for sale? Thank you for your article. great job! 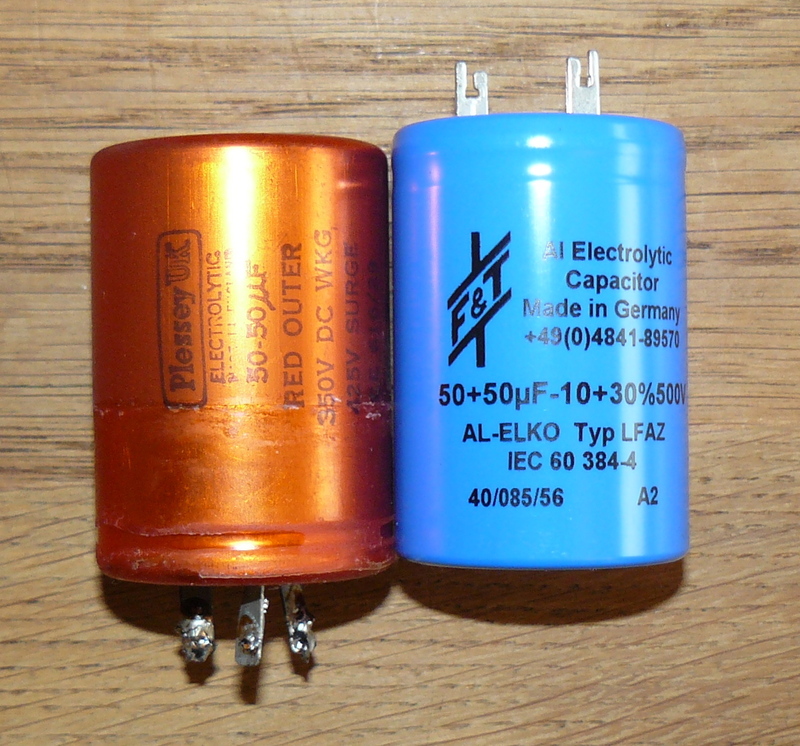 For grid stoppers, as for anode and cathode resistors, 1W are OK. For power supply : 2W resistors, for R15 and R16 : 5W (or more). Cool for refreshment project, let us know ! Thank you for that fast answer! And for anybody who reads this, if you have a spare knob (genuine, just like t-geek ones, silver), please make an offer! 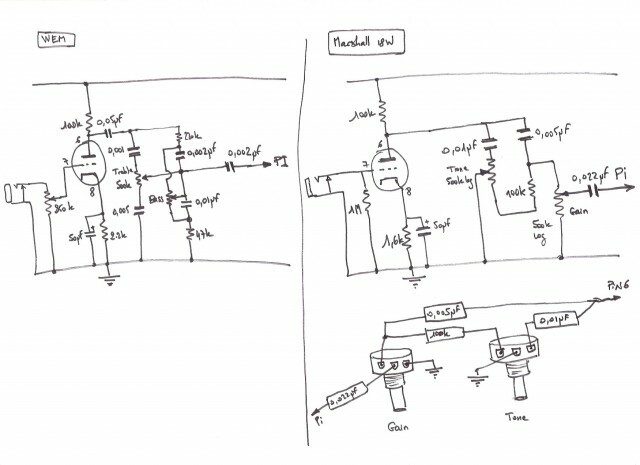 Yes, the center tap of the OT (AT THE PRIMARY) is to be connected to the High voltage (push pull principle). 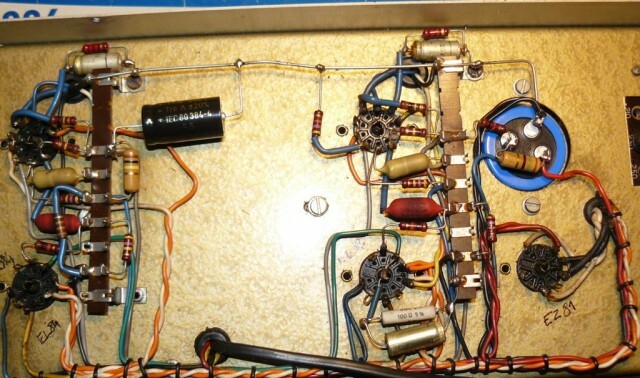 Plug to the loudspeaker cab is at the secondary of the OT. And you’re right, it is C22 that has exploded, not C5 as I mentioned above! Edit : OK then, obvious when seen “in real life” (and not a picture ). This tap is not connected on my amp. 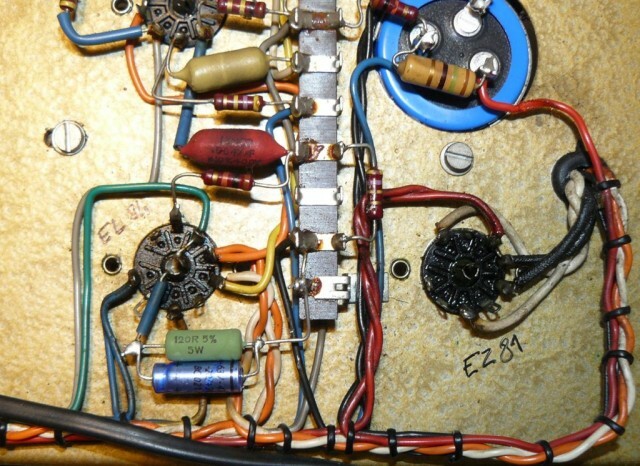 I think it is a 8Ω tap or something like that (by default, the amp uses the 16Ω tap …). On yours, maybe a previous owner used 8Ω and 16Ω output by the way of an output jack or selector installed as an upgrade ? OK, thank you for checking! 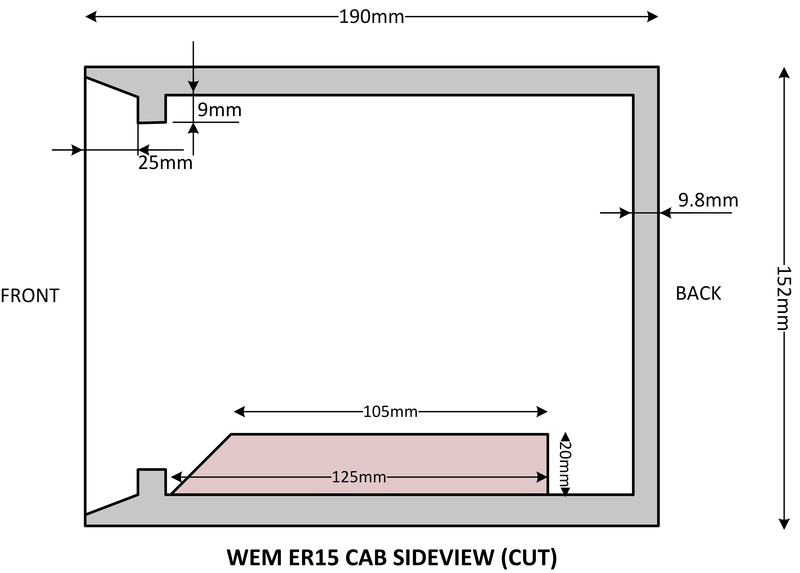 Reading a bit more the web literature, I now guess this was made to be able to plug it on (super) dual 10 or 12 cabinets (2×7,5Ω) and/or to fit both 8Ω and 16Ω as it seems that customers could order with one or other option. PS : next step : Blues Jr mods after seeing your link to Billm… few kits ordered!!! Nice cab and nice telecaster ! How does it sound ? Cool for your Blues Junior ! A lot of harmonics are back now and as I play it stereo’ed with my Blues Jr., it’s like I had plugged a third amp! Sorry to bother you once more. 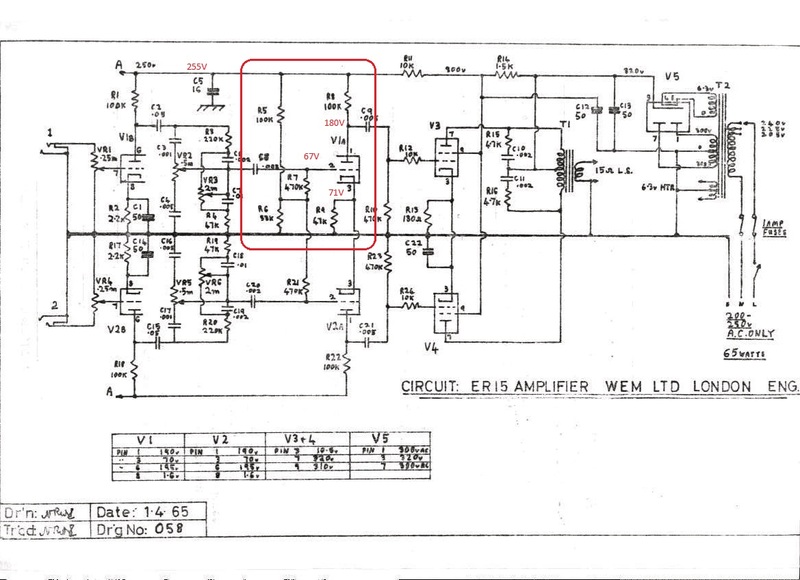 I try to know if this amp is class A or AB to get the correct bias value (range) and check/correct it on my amp. If you have the answer, could you explain please? I’ve just had a short time to make some measures. 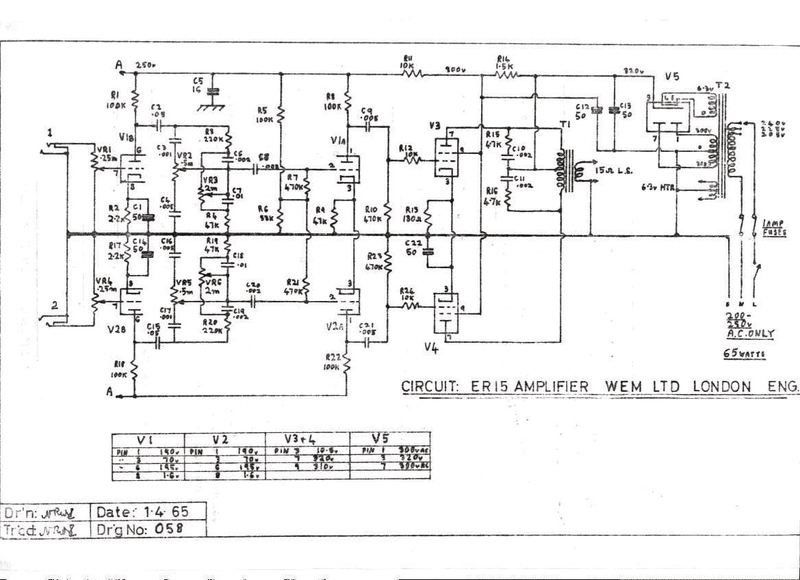 10,5V is what I have, so, as you say, it “must be” OK. 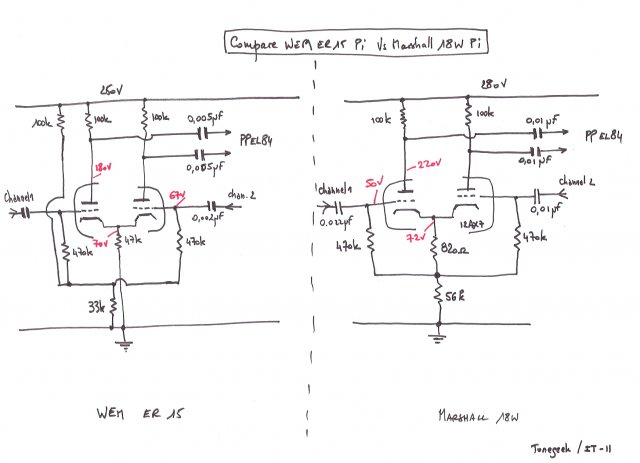 I see that your PT optional jumper is set on 220V… Is your Va=320V measured or taken from schematic? …there’s something I don’t understand with that difference between the schematic and measures… but well, it works so why scratching head? Hi and nice page with lots of information! 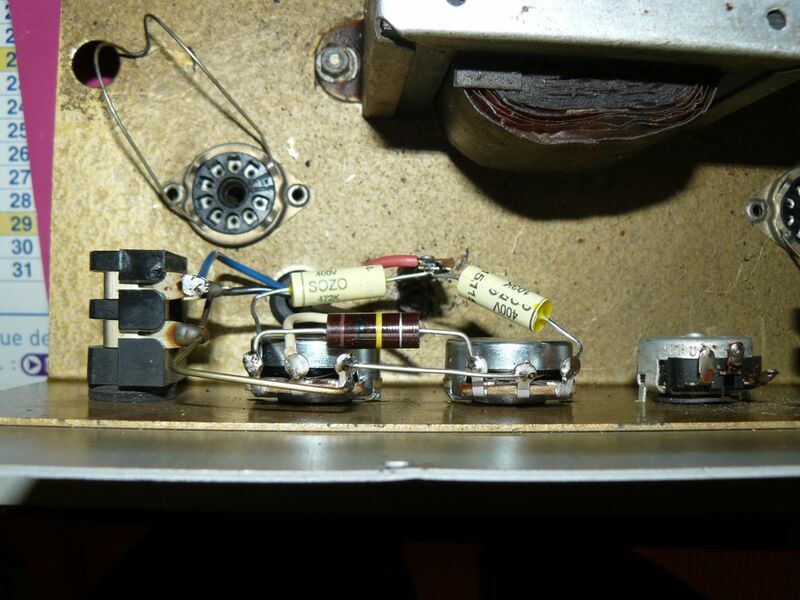 !, now where could I get hold of a new audio transformer, the one in my amp seems to have melted. 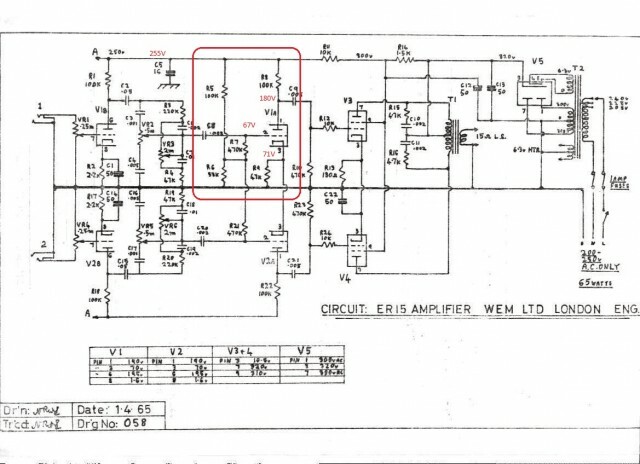 Thanks for any information you may be able to provide me and as I am an electronic engineer I will be able to do the change myself. thanks again Fernando. Let me know and be careful with the high voltages, check the PSU caps ! I’ve had an ER15 for 30 years now. Bought it at a boot sale for £4 when people didn’t want them, ironically , because they were valves. Fixed it with a few caps & loved it and kept it. 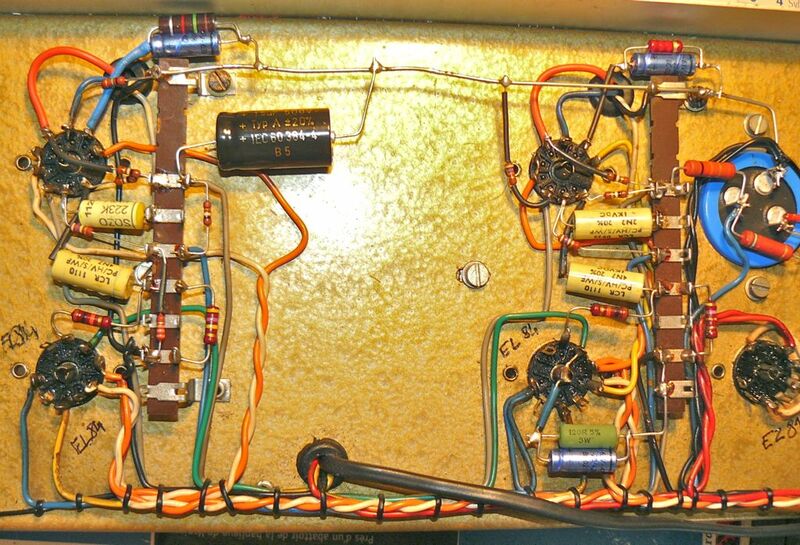 I’ve though from the very beginning valve amps sounded best. Can’t beat it to get a Quo sound out of it for that price !